Our favorite activity at Christmas! There’s just so much to do at Grouse Mountain, with skating, reindeer, gingerbread houses, sleigh rides, the light tunnel and meeting Santa. And of course, there’s skiing, snowshoeing & snowboarding. DEFINITELY not to be missed. Grouse Mountain’s Peak of Christmas events go until January 6. For more information, please click here. Vancouver Christmas Market has been a beloved holiday tradition for locals and visitors alike for almost a decade. The Vancouver Christmas Market features more than 80 huts of sweets, treats, and treasures in authentic German-style. It’s located downtown right by the waterfront at Jack Poole Plaza. It’s a nice walk from any of the hotels in downtown Vancouver. The Vancouver Christmas Market is open until December 24th. To learn more, please click here. 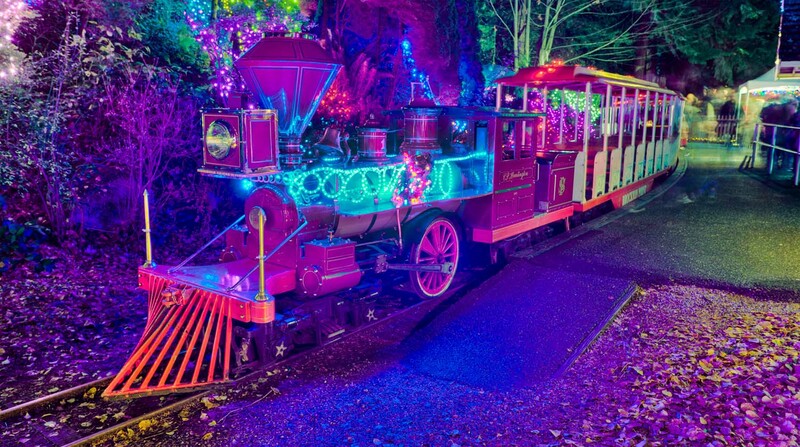 During the holiday season, the Bright Nights Christmas Train and Stanley Park Train Plaza sparkle with three million twinkling lights! This is one of the best & most affordable Christmas activities to do in Vancouver. Donations at the front gate and a portion of ticket sales go to the BC Professional Fire Fighters’ Burn Fund, to help burn survivors and their families. Bright Nights is open Thursday, November 29 to Saturday, January 5. Wish to explore other attractions? Check out our VanPass voucher promo which grants you immediate access to 20 Top Vancouver options, such as: VanDusen Botanical Garden, Capilano Suspension Bridge Park, Sea to Sky Gondola, and many others! The Singing Christmas Tree is a free event which takes place over the course of six days (leading up to Christmas)! It involves a cast, choir and support staff of over 250 volunteers, and the stage features a giant Christmas tree with 10 levels from which over 80 members of the choir perform! The show involves singing by the choir, solo performances, mini-skits, acrobatics, dancers and even people floating down from the ceiling. Singing Christmas Tree performances in 2018 are on December 7, 8, 9, 14, 15, 16. Here is more information on what to expect. Hope to see you there!